Ored stared intently as the drops of blood dispersed in the water, turning into red wisps of smoke and then disappearing altogether. And still, no one came. He had already poured all of the alcohol in the river, and the other offerings were gone as well. All Ored had left was the empty bottle; a slippery, living thing in the palm of his sliced hand. “Where are you?” he shouted, throwing the bottle in despair. It landed on one of the rocks, breaking into a hundred pieces, a glittering rain that — like everything else — disappeared without a trace. He turned his back to the river, resigned to walking home without having accomplished anything. The sound of a violin made him freeze. He didn’t dare turn around, didn’t even breathe, just stood still and listened. It was very quiet (he had to strain to hear it over the roar of the river), and oddly nondescript. After a while it changed, growing in intensity and turning into a discordant and vibrating tune; clearly emitting the feeling of anger and frustration. Then, as sudden as it had begun, the music stopped. Swallowing, Ored turned around and faced the river once more. Näcken sat on the stone that the bottle had shattered on, slumped forward over his violin. “Why did you stop playing?” Ored asked, hating the way his voice shook. “I cannot fully play what has yet to be finished,” came the reply. Näcken’s voice was unlike any Ored had ever heard. It had a light, almost feminine, ring to it; like a mix of slowly trickling water and the most exquisite music. But there was an undertone to it, murky and unnerving. It sounded like a drowned man trying to speak; lungs squelching with water and tongue half-eaten by fish. Ored didn’t understand the answer, but wasted no time dwelling on it. “I want you to teach me how to play like you,” he boldly stated, squaring his shoulders. “I know. Why else would you be here?” The creature raised his head, angling it up in a disturbingly boneless manner. The long hair still obscured his face, hair the dark color of algae removed from water. Without another word he slid into the water, vanishing from Ored’s sight. “Wait-” he shouted, stumbling forward in desperation. But he hadn’t needed to worry; Näcken reappeared almost immediately, gracefully pulling himself up to sit by the very edge of the riverbank — a mere step away. Relief (and more than a little fear) made Ored’s legs give out, and he found himself sitting on the grass, face to face with his would-be teacher. Ored heard the question, as loud and clear as he could hear his own heart beating. But his brain was too taking in the appearance of the one in front of him to possibly put his answer into words. Näcken was beautiful. The most beautiful thing he had ever seen. Pale and smooth skin covered his slender body, as hairless as a woman. But there was nothing female about his face; all strong jaw and high cheekbones. His eyes were deep-set, and though they were of an extremely pale shade of blue they still burned, making Ored feel like his very soul was being pierced by that watery gaze. “I… It’s a gift I must bestow on someone,” he finally managed to press out. Ored knew what lake he meant, but didn’t like the prospect of going there. It was a stagnant lake, dead and dark, a place no one ventured. But he had little choice in the matter, so he just nodded in reply. “Bring your violin,” was the last thing he was told. The long day passed in a blur, his mind unable to focus on the work at hand. He got scolded more than once, but he barely heard them — Näcken’s otherworldly music still rang in his ears. When the night so finally arrived, Ored went to the servants’ quarters with the others and feigned sleep. As soon as the moon was high in the night sky, he soundlessly got up and snuck out. He had to make a detour in order to pick up his violin, hidden at the base of an old cairn. It was the only place he knew it would be safe in: no one ventured near it for fear of the ghost who was said to haunt the place. She’d been violated by an unknown passerby, and the shame had driven her to take her own life. Only twelve years old, but the hate had been as strong as any full grown woman, condemning her to such an existence. But the fear of having the violin discovered far outstripped the fear of a vengeful ghost, for one reason and one reason only: she would surely be punished, should anyone find poor Ored with the expensive instrument. 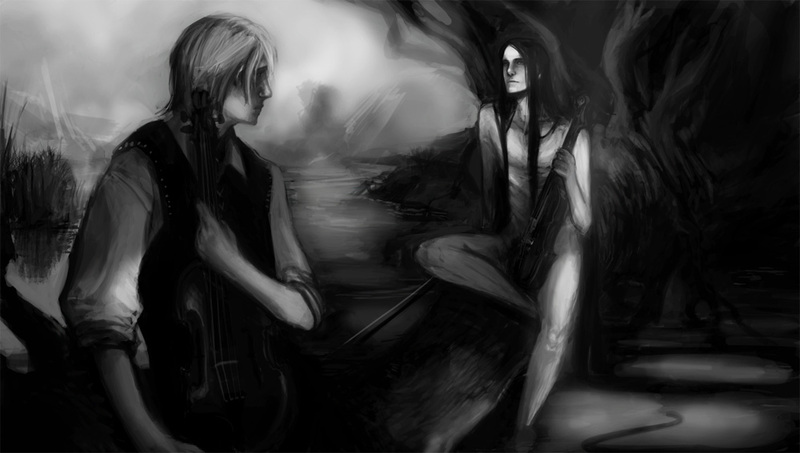 Hugging the violin, still wrapped in cloth, to his chest, and with dirt soiling his shirt, he ran towards the lake. Music guided his last steps, in the very thick of the dark forest. Finally, Ored reached the clearing, his feet treading on the marshy outskirts of the lake instead of the forest’s endless grounds littered with pine needles. No trees meant that the moonlight reached the ground, but that only served to make the lake look that much more menacing and unnatural. A tree had once toppled over, and still lay half in the water — the base of the trunk and its roots were tilted upwards, as if desperately reaching for the sky. They almost looked like human arms and hands, those pale roots, all twisted like worms on a hook. Näcken sat on the trunk with just his feet dangling in the water, completely shameless in his display of manhood. He stopped playing, extending his bow to point straight at Ored. “Come to me,” he ordered. There was nothing beautiful in his voice anymore, nothing soft or feminine; just a distinct promise of a cruel end, should Ored be foolish enough to obey. Fighting the urge to just turn around and run, Ored stepped forward. The murky water seeped through his shoes in seconds, cold and pulling. There was a quick glimpse of disappointed despair flitting over Näcken’s face, but it disappeared as soon as it had come. Ored stopped a couple of meters away from him, knowing better than to actually walk further into the water. Instead he climbed up on the tree, carefully dragging himself forward until he was straddling the trunk mere centimeters from the deadly creature. “Close enough?” Ored knew it to be a pathetic thing to take pride in, but it felt like a triumph to be able to ask the question without his voice wavering. A pale hand, made even whiter by the shine of the moon, reached out. It gripped his collar, and in one powerful tug ripped open the front of his shirt. Clammy fingers found their way inside, settling to rest on his chest. ‘Please,’ he wanted to say, ‘please, not yet!’ But no words could be forced past his tightening throat. Näcken frowned. “Continue,” he prodded. “She’s the young mistress of the house I serve. I obviously have no place even speaking of her, much less count her as my friend. But she…” Ored trailed off, at a loss of how to possibly put his feelings towards her into words. “Beautiful craftsmanship,” Näcken said, voice light and appreciative. Ored nodded, all the while letting his fingers stroke the smooth wood. Maybe seeing him treating the instrument so tenderly made Näcken ache to do the same, for he placed his own violin into a playing position. Closing his eyes, he drew the bow over the strings. “No,” Näcken interrupted, “I don’t mean it like that. Do you love her, like this?” He leaned forward as he spoke, closing the space between them in one smooth motion. His lips were cold. It was Ored’s first kiss, and it was nothing like he’d imagined. Invasive and coaxing, forcing him to return it even though he wanted nothing more than to wrench free. “I will. I understand now.” His voice carried that intense tone of regret again, but Ored just felt relief over his words. “Play for me,” Näcken asked. Ored lifted his prized violin, and clumsily played a joyful ditty. It seemed ill suited for the dark forest and the creature who stared at him so intently, but it was one of the few songs he knew. As he got halfway through it, Näcken raised his own violin, seamlessly joining in. It was a perfect rendition of what Ored was trying to play, more than perfect even. It was somehow happier than the original, exuding a vibrant tone of joy that was at odds with Näcken’s pained facial expression. And as their impromptu duet continued, Ored found himself playing better and better. As the last notes passed through their bows, they were in perfect sync. “That’s… a-amazing!” Ored stuttered, for a second forgetting everything and simply relishing the feeling of being able to truly play. And Näcken smiled. The first true smile he’d shown Ored, a dazzling sight that even seemed to dim the bright stars above them. “One more time?” Ored begged. Ored climbed off the trunk, wincing at the stiffness in his body. Hesitating before leaving the clearing, he finally turned back to execute a quick bow to his teacher — hoping that it could convey what he was unable to put into words. He saw Liv the next day. She stood on the balcony, looking towards the stables. Ored caught sight of her as he lead Brunte, the Ardenner horse he was going to plow the fields with, across the courtyard. She was pale, with dark shadows under her sky-blue eyes. He sent her his bravest smile, feigned though it was. But before she had a chance to return it, a couple of maids whisked her away — perhaps afraid that she’d jump off. “I’m sorry,” Ored wheezed, out of breath after running through the forest. He patted the trunk, making it clear that he wanted Ored to take up the same position as the previous night. As he climbed up, Näcken began playing. “Just try to keep up,” he instructed, apparently not thinking it important that Ored had never even heard the song before. But, after a few cringe-inducing false chords, he caught up. The duet was as wonderful as it had been yesterday, and when the song ended Näcken segued into another — Ored following. He soon lost count of their songs, even taking the lead in starting a new song when the old one had finished. Finally, Näcken broke the spell. He lowered his instrument, watching Ored with something akin to expectation in his strange eyes. He went on, babbling mindlessly, until his lips were besieged once again. It was still cold, but nowhere near as uncomfortable. He returned it freely this time, and felt a pang of loss when Näcken pulled back. Ored swallowed, not understanding why the simple explanation seized his heart so. “…See you tomorrow.” That said, Näcken swiftly slid off the trunk and disappeared into the dark water. It was almost with a sense of loss that Ored walked to their meeting place that night. Tomorrow was the wedding, so this would be their final lesson. As insane as it was to feel that way, he would miss it. The lake was empty when he reached it, Näcken nowhere in sight. He crouched down at the edge of the water, dipping his fingers in. It was cold, but not unpleasant. Finally, Ored got up, walking over to stand with his back leaning against a tree. Lifting his violin into position, he began to play. Not to play something he knew from before, but just to draw his bow over the strings — letting a new song form itself. He did his best to truly put his feelings into it; to somehow impart his gratitude and, most important of all, the fact that he’d actually miss Näcken. When Ored finished the song, he opened his eyes only to see the beautiful creature of music and water standing in front of him. His face was wet, but Ored couldn’t tell if it was tears — or just water from the lake. Closing the space between them without a word, Ored kissed him. An arm snaked its way up his back, long fingers caressing his neck before nestling in his hair. Näcken tugged, and Ored willingly bent his head back — giving free access to his throat. “You won’t,” Ored said, somehow knowing it to be the truth. Näcken gave no reply, but he did ease his grip. His other hand went to unlace the front of Ored’s hose, pale eyes never leaving Ored’s — holding him transfixed. Ored gasped when the cold hand wrapped around his length, only to moan when it started stroking up and down in a torturously slow motion. Näcken then let go of him, only to kneel down to lick his way up Ored’s manhood — perversely pointing upwards in a way that should have made Ored shrivel in embarrassment and shame. But, as it was, the sight only served to make his knees buckle. Näcken caught him, pushing him against the trunk of the tree in order to make him stay upright. After what felt like an eternity, Näcken stood back up, angling his hips forward and making his own length touch Ored’s. Cold fingers wrapped around them both, going up and down in a frantic, desperate movement. Light sparked between Ored’s eyelids, and he lost it. He felt his release, from the soles of his wet feet to the very top of his sweaty head. Näcken squeezed one last time before letting go. Raising his hand, he slowly licked away every drop of the thick liquid. With nothing holding him up anymore, Ored slid down the trunk. He tried to fight it, but sleep overtook him anyway. He dreamt. Strange, muddled dreams. Näcken played for him, a soothing song that made him feel safe. Then, before returning to the lake, he picked up Ored’s violin. Pulling a finger slowly across the strings, Näcken spoke. But what he said didn’t make it through the fog of sleep, and all Ored saw was his lips mouthing words. He woke when the sun stood high in the sky. Cursing to himself, he took hold of his violin and began to run. The celebration was in full swing when Ored reached the neighboring house. Unlike the actual ceremony, everyone was welcome to join in. Gripping the violin’s neck hard enough that the strings cut into his palm, Ored walked towards the open-air dance floor. He spotted Liv immediately, looking frail in the pristine dress they’d made her wear. Her blond eyelashes were dark and spiked — obviously from crying, judging by her red-rimmed eyes. As if she sensed him, she turned her head, eyes focusing on him right away. He wanted to smile at her, but simply couldn’t. Instead he raised the violin, asking a silent question. A sense of calm and relief took over her features, painted mouth curving into a pensive smile. She nodded. In a daze, he walked up on the wooden floor. She must’ve requested that he play, because the other musicians respectfully stepped aside for him. Raising the violin, he caught her gaze one last time. Tears were in her eyes, but they nonetheless shone at him with genuine affection and gratefulness. Closing his eyes, Ored began to play. The strings broke, cutting his face and making him stagger back. He was dizzy, and could barely see. Then Ored realized that he couldn’t see very well because it was dark, moon having long ago replaced the sun in the sky. Body shaking, he lowered his eyes. They were all lying around him, scattered on the floor like broken puppets. Eyes stared unseeing at him, frozen in a pain and panic. Someone screamed, and it took him a while to realize that the sound had come from his own throat. He dragged his feet towards the crumpled form he knew to be Liv, falling to his knees beside her. Blood from her nose made for an extreme contrast with her deadly white skin, dyeing her teeth as well — fixed forever in a terrible grin. He sat for a long time, just looking at her. Finally, he tried to close her eyes. But they just slid open again, stiff and cold to the touch. Ored threw up, but didn’t cry. He carefully placed the violin beside her, before getting up. Without looking back, he walked to the forest. A song he had heard before greeted him as he arrived at the lake. It was the one Näcken had played for him on that first day. But this time it didn’t abruptly end, instead continuing and turning into a happy song before it ultimately changed — becoming melancholy and full of despair. And as he listened Ored cried, the knot in his stomach finally released. “That’s a special song,” Ored said when Näcken was done playing. Laughing, Ored followed him down. Finally, I would like to thank amei — without her this story would not have been written. This entry was posted in Bang*Bang no. 12, Text and tagged amei, Zack. Bookmark the permalink.